Your order may be subject to VAT at the rate applicable in your EU Member State. All orders are processed by 2Checkout, our authorized vendor. A license for legal entities, including companies, organizations (both for-profit and non-profit) and government. The Commercial license grants the Licensee the right to install and use the Product by any developer/on any machine within a company/organization, provided that the total number of developers using the software at a time does not exceed the number of purchased licenses. The use of the software is restricted to a licensed legal entity or an individual developer with no right to transfer the software to third parties. Includes 1 year of free product upgrades and technical support since the purchase date. (updates include all the major versions, including support for all supported Visual Studio editions). A license for individual developers who acquire it using their own funds. The Personal License grants the Licensee, as a Named Authorized User, the right to install and use the Product as long as the Licensee is the only person using it. The product can be installed on different computers, provided that multiple instances of the software will not be used at the same time. A Personal License is not available to a company, or to an individual who expects reimbursement of the license fee from a company. A Personal License is property of the individual who has purchased it using his/her own funds. The Personal License is non-transferable. It includes 1 year of free product upgrades and technical support since the purchase date (updates include all the major versions, including support for all supported Visual Studio editions). Applies to Companies and organizations, including non-profit and government. Individual customers using their own funds for purchasing it. Personal licenses purchased and then reimbursed by a company are not valid. Multi-user license? YES – It can be used by any developer within the company or organization, provided that the total number of developers using the software at a time does not exceed the number of purchased licenses. NO – A Personal license can be used only by the person who purchased it. License terms Both types of licenses are perpetual for the licensed version of the software. Each one includes one year of free product upgrades and technical support since the purchase date. *For the EU customers: company VAT ID is not accepted for purchases from private individuals. **Prices are excluding VAT. Purchases from EU members can be subject to EU VAT. If you have any questions, please contact us at info@devsense.com. Each PHP Tools for Visual Studio License entitles you to all major and minor updates for a period of one year from the date of purchase. After this period, you may continue to use PHP Tools but are no longer entitled to free updates. In order to continue receiving updates you will need to renew your Maintenance and Support Subscription. Renewals add one year from the expiration date of the previous Maintenance and Support Subscription, not from the date of purchase of the renewal. You are eligible to renew your subscription if your subscription has not yet expired or it has been expired for less than 90 days. Valid Maintenance and Support Subscription allows you to upgrade to a new Visual Studio version at no cost! You will receive a renewal notification email when your Maintenance and Support Subscription is about to expire with instructions of how to take advantage of the renewal offer. You can also choose to automatically renew your Maintenance and Support Subscription. The auto-renew option can be enabled or disabled at any time. For your convenience, PHP Tools for Visual Studio are using Visual Studio Update process. We recommend to turn on automatic check for updates. This way Visual Studio will notify you when an update is available and you can install it directly from Visual Studio. Please make sure your Maintenance Subscription is valid before updating or turning on auto-renewal for your subscription. PHP Tools for Visual Studio comes with a trial free of charge for 30 days to ensure that it satisfies your requirements before purchasing the full version. Due to the nature of software license, no refund or exchange is available after activation was made. It is possible to pay with a purchase order, but it has to be addressed to our authorized vendor Avangate. DEVSENSE does not sell its software directly. Enter our store or use the renewal link if you have already purchased the license. Select the desired quantity of licenses. Fill in the billing details. As "payment method" select "Purchase Order". Fill in the internal purchase order number if you want to use your own Purchase Order document. If not, you will be provided with a PO pre-filled form which is only necessary to add date and signature. After placing your order, you will receive an email confirmation and more information regarding the products/services delivery. Please, send us the Purchase Order document by fax at 650-963-2973 (US/Canada) / +31 84 725 1599 (International) or by email at pay@avangate.com. You can use the PO pre-filled form which will be generated for you. Or you can use your own Purchase Order document. To identify your order, please specify the reference number (the number will be available after the order has been made). All the invoices for Avangate orders are generated as PDF documents. 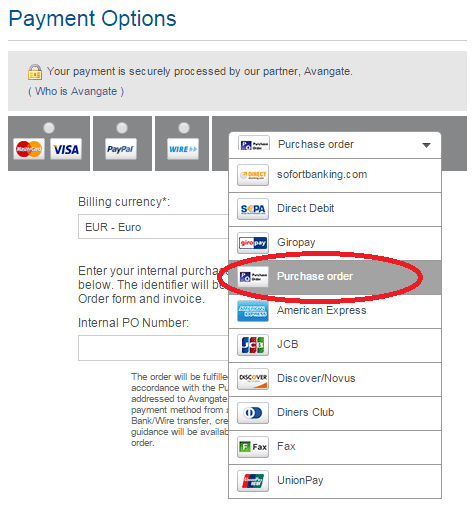 The invoice can be downloaded by logging in to Avangate "myAccount", in the "Order History" section. If you are ordering on behalf of a company, the invoice will be sent automatically to the billing email address provided during ordering. When you access Avangate myAccount for the first time, go to "Forgot your password?" link and enter the email address that you have used to order. be signed and dated by you, in order to be valid. have "Avangate BV" as Vendor. Your subscription has expired and renewal is no longer available. However, as a returning customer, you may purchase a new license with discounted price. All licenses provided as part of the Academic License Program are valid for one year. As long as you're a student, you're welcome to keep taking advantage of the Academic License Program and renew your Academic License for the next year, free. When you graduate from an educational institution (and thus no longer eligible to renew your Academic License), we would like to offer our congratulations and give you a 25% Graduation discount compliments of DEVSENSE! The discount should be redeemed within 1 year of the Academic License expiration date. However, should you renew your Academic License, a similar Graduation offer will be available to you the next year around. To renew your Maintenance and Support Subscription please enter your license key. Login to your existing account or create a new account with the email address used during order (you can use also order number). Navigate to "My Products" tab and click on "Renew Now"